We decided to make a costume for my son using things that we had at home. 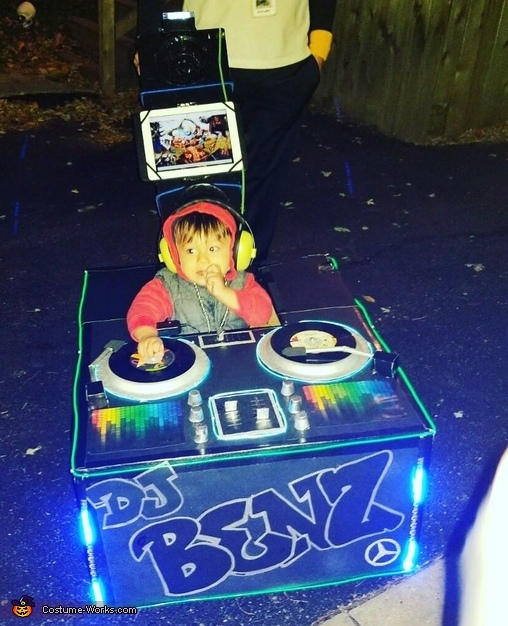 I noticed the Baby Banz earmuffs I had purchased a while back and decided that a DJ would be most fitting for my son's costume. He is definitely the life of the party and he always wants us to put on music so he can show off his moves to everyone. This costume cost me $50 because of the lights and misc things. I measured and fitted the cardboard boxes to go around his trike for the speaker with the iPad holder on the trike handle and DJ table around the trike. Milk creamers and eraser spray painted were used for the nobs. I glued 2 paint brushes together for the needle turn table and attached it to the box with a washer and a nail so he can move them. He was able to spin the records. The lights were battery operated and they flashed to the music. We used zip ties to secure it to the cardboard box. For music we used a blue tooth speaker that went behind the speakers in the cup holder and played special effects on the iPad. For his outfit my husband thought since he was DJ Benz to put a Mercedes Benz logo on his necklace and we made him a microphone. People were stopping to take pictures and he kept dancing the whole night. The family came out and we dressed as ravers!